MAY 28TH 2002 Lunar Penumbral Eclipse. JUNE 10TH SOLAR ANNULAR ECLIPSE ACROSS PACIFIC OCEAN. GREATEST ECLIPSE 23:44 U.T. Mars/Vesta conjunct over Hawaii. (The Royale planetary chakra). Keeper of the sacred feminine, kundalini flame combines with strength and purpose. Sun/Moon/Saturn conjunct. Spirit, soul and the form giver are in alignment giving us the opportunity us to bring our spirit into our ´bones´. DEC 4TH 2002 TOTAL SOLAR ECLIPSE FROM SOUTHERN AFRICA TO AUSTRALIA. Two Total solar Eclipses pass over the same area of land within the space of eighteen months, this is very unusual if not unique, it has lead us to look very closely at the planetary dynamics for these two cosmic events.. and believe me they are cosmic! The first question is, why Southern Africa? Well, since travelling to North Eastern South Africa for the 2001 eclipse a greater depth of understanding has come to me. All this Summer of 2001, Mars has been astrologically in the sign of Sagittarius, but what we observed by gazing up at the beautiful southern night sky is that sidereally (the actual position of the planets as we see them, against the back ground of the stars), Mars was in the constellation of Scorpio. Mars was right next to the star Antares, which is the brightest or ´alpha´ star of Scorpio. The Mayans of Central America know Antares as one of two ´gateway stars,´ the other being Pleiades which is at the other ´end´ of the Milky Way. The Mayan dead are said to journey along this ´road´ between these two stars. Because of the great distance between the Earth and even our closest star, their relative position to us only changes very slowly, so they are said to be fixed stars. Unlike our solar system planets, which are overhead at different places at different times of the year, the stars always travel along the same latitude. The constellation of Scorpio moves over South Africa; in fact, Antares goes almost exactly over Johannesburg. Just look at South Africa´s present and past history - everything from the ´shining light being´ of Mandela to some very dark deeds being perpetrated by some black gangs. And of course, mining activity which is carried out extensively in South Africa, digging deep into the Earth to bring to the surface something that is precious, rare and beautiful ~ Scorpio yes! Many mythologies around the world talk of a time when we had two Suns in our sky. A NASA scientist recently expounded his theory that star systems which are binary i.e. a solar system with two Suns, is most likely to develop life ~ I guess due to the large amount of light and warmth present. In many sacred writings and mythologies from around the world a story of a cosmic catastrophe crops up again and again. They talk of a massive explosion occurring in our solar system. There are many theories and much speculation as to what may have occurred; one is that an ´object´ gate-crashed into our solar system upsetting planetary orbits and possibly colliding with Phaëthon, which may have been our second Sun or, as some think, the planet Marduk of the Mayans. The consensus is that the remnants of this collision is now the asteroid belt, the many, many thousands of fragments of the disintegrated Phaëthon (photon = light). Phaëthon was son of Helios, god of the sun. Helios had rashly promised to grant his son anything he wished, and Phaëthon chose to drive a chariot of the sun across the sky. Vainly, Helios tried to explain to him that no mortal could drive the chariot; Phaëthon, however insisted that his father keep his promise. Helios explained the dreadful hazards but reluctantly yielded. Soon Phaëthon realised that his father had been right. Terrified, he lost control of the horses, and driving too near the Earth set it on fire. To save the world from utter destruction, the god Zeus (Jupiter) hurled his thunderbolt at the rash young driver, killing him instantly. Dr Eric Morse in his book, The Living Stars also believes this event to be pivotal in the Earth´s history, he talks of how independently a colleague and himself calculated the orbit of the remnant core of Phaëthon to be in the same orbit as the largest Asteroid in the asteroid belt ~ Ceres. Ceres is unusual in that it is the only known asteroid to have a smooth surface and to be spherical. There is another point which may seem tenuous, but I believe has greater significance than at first appears: it is that Ceres´ size is always equated to the size of the British Isles and, given the spiritual importance these sacred Isles hold for the coming Aquarian age, is there some key held within the encoded energy grid here in Britain that connects back to the demise of Phaëthon? Was Phaëthon our second Sun or another planet? Our feeling is that Phaëthon was in a sense our mother Sun, balancing our more masculine father Sun, so whatever it was that happened Ð it does seem to be quite clear that some very large ´readjusting´ of our solar system occurred. One possibility is that Pluto (an inner solar system type planet) was flung out to it´s present distant orbit from the Sun. If Phaëthon orbited in the same region as our present Asteroid belt, then as it exploded it would have ´burnt´ Mars, which would explain why a once habitable planet with water, an atmosphere and intelligent life got so wastedÉ.did the Martians know this would happen and leave clues such as the celebrated Martian pyramids and the ´face´, for us to know that once there had been an advanced civilisation there? Why is NASA right now is so keen to send probes and robots to find out more about this red planet? Maybe a fragment of this exploding Sun, perhaps even as large as an asteroid, struck the Earth crashing into what is now the Gulf of Mexico, causing the Yucatan Peninsular to rise out of the sea, providing a ´clean´ land for the Mayans to open vortices on which they built sacred places like Tikal, Chichen Itza, Palenque and many more. There is also much mythology around this time that the ´rogue´ that upset the tilt of our planet was Venus, and that it may even have been the celestial body that caused the downfall of Phaëthon (see Immanuel Velikovsky - Planets in Collision and Earth in Upheaval). My feeling, having travelled to the Mayan lands many times in the last few years is that the Mayans needed this ´clean land´ to anchor Pleiadean frequencies for the ´quickening´ that would bring the needed shift in consciousness that is happening now and is taking us to the ´end of time´ (Mayan time) of 2012. What may have occurred at this time around 8500 BC is a shift in the rotational axis of the Earth. A distinguished French academician Louis-Claude Vincent has identified that our equator once ran approximately along the present north- south meridian of Stockholm and Capetown and there is geological evidence to back this up. Venus is at 3 degrees Scorpio, Juno is at 2 degrees and Mars is at 1 degreeÉ remarkable. So for the moment of greatest eclipse when the shadow is being released and the portal is open for a new encodement to imprint into the consciousness of this planet these three are in conjunction. Juno the asteroid Goddess of sacred union/marriage is ´marrying´ the archetypes of the expression of the feminine and the masculine on this planet and this is occurring at the place where we witnessed the demise of what was probably our Solar Goddess. Feel how deep that imprinted into our ancestral, genetic collective memory. It was from that time on that our Sun was known as Sol (alone) and from that point we started this part of our walk upon this Earth ~ alone. It was thought that before that time we also had two Moons, one of which was dislodged by the heavenly calamity because, once again the word Luna means alone. If we lived in a solar system with two Suns the chances are that most of the time one or other of the Suns would have been in the sky and probably the darkest it ever got would have been twilight so not a lot of chance to tune into stellar energy - no visible stars. So when we lost one of our suns, for the first time we have real darkness Ð wow, how amazing that must have been. We can see we are not alone in the Universe that there are other light sources we can attune too, sensing that these light sources are totally different to that which we have had experience of so far. Whole new dimensions to aspire to, to explore and to bring into the Earth´s consciousness matrix. And what of Ceres? Well, she now brings us her energy, in a sense of a diminished Mother, not the equal to our Father but still embodying fertility, abundance, fruitfulness, harvest, the mother with many breasts to feed her children, an Earth Goddess. Check out where Ceres is in your natal Geocentric and Heliocentric charts viewing her from this perspectiveÉ it could give a glimpse at a deeper dynamic within you. I´d love to go into the many amazing stories held in this chart but what´s already said is enough to hold for the moment. You see Mars, Juno and Venus meridians are right over Africa through what was our equator before the Earth was tilted by ninety degrees ÉÉinteresting point if you place the equator as it was and now is, you get a cross, four directions ~ have we all been sacrificed ´alone on the cross´ without our Mother Sun for 10500 years, well if we have , this eclipse in some way integrates the experience within us. The black letters on this chart over Iceland, Britain and Europe are the Stars of Ursa Major, the great Bear and if you follow the ´handle´ down you get to the star Arcturus (the bear prodder). Near to the glyphs of Mars, Juno and Venus is Spica, the Alpha star of the constellation of Virgo. Spica is the Ear of the Wheatsheaf that the Virgin of Virgo is holding. The shading on this chart depicts the night time and day time. This is the way the energy flows: in through the Pole star into the stars of the great bear out through the handle into Arcturus and into Spica do you see how Spica is on the eclipse line ~ more indications of a harvest..
Do you see what the energy is doing, its coming in through the North Pole and flowing via the Stellar pathway out from the darkness into the light. In 2001 Chiron and Mars conjuncted the Galactic Centre, so an impulse came from the centre of our galaxy into Chiron which imbued it with the deep healing quality which then embraced and re-aligned the energetic quality of Mars. Since that time both Venus and Mars have had ´meetings´ with various other planets to empower, to soften, to enliven, to quicken and to crystallise in order to be ready for the MARRIAGE of the prince and princess over Africa on the 2nd December 2002 -- the heart of the world. How long ago was it since you were invited to a wedding like this one? Consciousness is evolving fast in these days leading up to 2012, therefore as we look into the slightly more distant future a couple of years ´down the road´, it becomes more difficult to discern clearly the meaning of the unfolding stellar and planetary dynamics. It seems the human condition is to only see the ´path´ a little way ahead of us. Because of this, the shocks and surprises have more chance of triggering us into opening our petals to the light. Cynics would say "where is the evidence that the consciousness of humanity is in any-way changing, let alone evolving?" and in a lot of ways that would seem to be a valid question. Yet a world consciousness is developing that is beginning to shun human rights infringements in whatever form that manifests. No longer, in a world flooded with communications, can Man hide his inhumanity to his fellow beings in forgotten parts of the world. No longer can governments and corporations of small and even the largest nations of the world hide their deeds from those that seek the truth, even though those same organisations can propagate much misinformation through the same networks. More than all of this is that if you have got this far in reading this booklet without wanting to tear it up then it is highly likely that you are part of the spearhead of consciousness manifesting on this planet at this time. Through your pioneering, you open the ´trail´ for our children and children´s children to push the frontiers of an expanded consciousness into greater understanding of the true nature of life and how to live beautifully. Lunar eclipses only occur at a full moon when the magnetosphere of the Earth extends right out to the Moon. The shadow of the Earth falls upon the Moon and, as you have probably noticed, these type of eclipses have a softer, less elemental quality to them, than solar eclipses. A Grand cross around the Earth at the time of this eclipse could make the energies challenging to deal with, but with the Sun conjunct Ceres and the North Node the theme is once again to draw our spirits ever closer to our more feminine Solar origins. This eclipse will be visible across the Americas. This is a somewhat strange, very short, annular eclipse that occurs only over Iceland for a very few brief minutes just as the dawn is breaking. The chart for this moment once again has the Moon´s North Node conjunct Ceres, and both are right on top of Pleiades. Interestingly the only planetary meridian in the path of this incredibly short eclipse is Chiron which also runs right through Iceland, a planetary brow chakra ~ precision encoding or what? 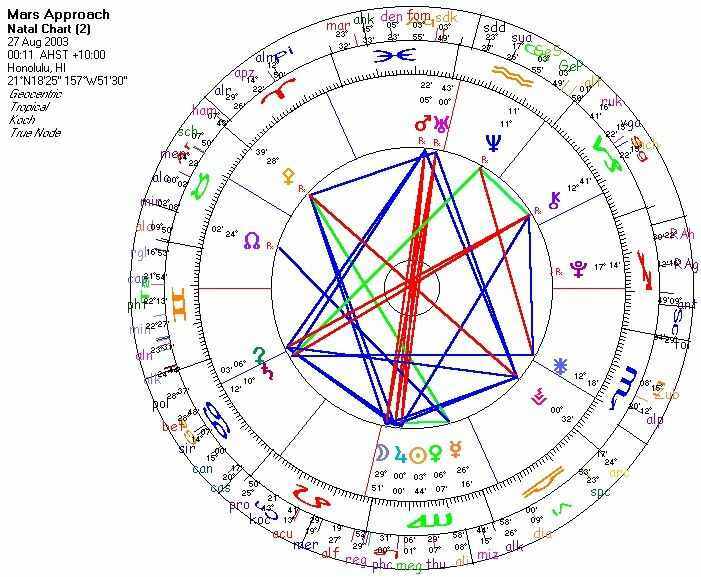 Interestingly, there is a gift through the form of the Grand Trine within this chart and, like the fiery land of Iceland with its volcanic activity etc, this is a fire trine. Also like the Heroines of the Icelandic tales this trine with Jupiter, Pluto and Pallas Athene has strong feminine warrior/wisdom qualities. Once again the Universe is challenging us to heal and use all facets of the feminine - underlined by the Moon´s North Node (spiritual destiny) being conjunct Ceres (Phaeton-Solar Goddess). This August heralds two significant astrological events in the unfolding pattern of planetary and personal evolution. The Full Moon was perceived as being of major significance by many different sources. There is no doubt that it will bring some profound changes in human consciousness. The Moon’s meridian line runs down the longitude of Bimini in the Bahamas, which has links to Atlantis, and the ancient seat of the Inca civilisation at Tihuanacu in Bolivia, said to have links with Lemuria. 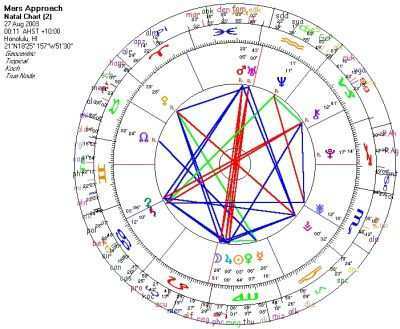 The chart, which is nearly forming a six-pointed star, is focused around a Grand Trine, formed by Mars retrograde in Pisces (08º 54’), Saturn in Cancer (08º 38’) and Juno in Scorpio (09º 07’). This marks a significant stage in the evolutionary process which was triggered by the Total Solar Eclipse on 11th August 1999 – then we saw Mars in opposition to Saturn, as part of the Grand Cross pattern - see our website at: www.bigfoot.com/~grandeclipse – this opposition marked the beginning of the process of healing the shadow energies (eclipses always offer the possibility for shadow healing) generated by millennia of separation between the mother goddess principle and the male warrior principle, and reflected in the dysfunctional aspects of current relationships between the mother and the male child within the human psyche, particularly in western cultures that have lost any connection to spiritually focused male rights of passage ceremonies for the young male adult to separate from the world of the mother and be welcomed into the realm of the fathers. The whole pattern of the emotionally immature male, unable to embrace their emotions as an adult and therefore unable to create emotionally healthy relationships, and unable to come into right relationship with the sacred nature of our planet, can be traced to the loss of such rites of passage, the ignorance of the fathers of these rites (they too were denied them), and the unwillingness of the mothers to fully let go and release the male child into adulthood. At an unconscious level, the mothers know that their boys will not grow into emotionally mature men in the hands and society of other emotionally immature men, so they too perpetuate the pattern of men remaining emotionally as boys, and so becoming unable to relate to women as emotional equals. But it goes much deeper and further back than that: it is rooted in the whole patriarchal view of the separation of spirit and matter, perpetuated by the patriarchal religions, but actually having its roots in the cataclysmic cosmic events which resulted in the tilt of the Earth to 23½º and the original “Fall” from the spiritual (Solar/Christic) dimensions into our present continuum, and the belief developed, or fostered by unenlightened beings, that we somehow have to struggle to return to our original Innocence and regain our Oneness. This is a big story and too long to be fully explored within the scope of this article, however it serves as a background to what is happening now at this crucial Full Moon. Now, Mars (male warrior) and Saturn (mother*/form-giver principle) come into a harmonious relationship through the agency of Juno, who carries the psychological-spiritual blueprint of Right Relationship from the soul’s perspective. This opens the possibility for the healing of Shadow energies and misaligned frequencies, which have resulted from aeons of this relationship being one of dysfunction and conflict. We are also seeing possibilities opening for this in current world situations, although it is largely being handled clumsily because of fear (Saturn) and vested self-interest. *NOTE ON SATURN AS MOTHER, NOT CRONOS/FATHER. From the perspective of “traditional” astrology and mythology, Saturn has been seen as Male – Cronos/Saturn who, mythologically eats his offspring, so that they will not overthrow him. As Archetypes change with the Ages, so too does the mythology associated with those archetypes. Saturn is essentially concerned with the creation of Form – this is a feminine quality of creation, the mother principle. (S)he is also an old Italian God of agriculture and harvest. As we moved fully into the patriarchal era (Age of Aries), the mythology had to reflect that, and usurp the creative power of Saturn to make it appear as a male energy, which is reflected in the myth. Saturn as Shadow, hiding the truth of its nature has to hide the evidence, which may reveal it for what it is – a feminine force of creation and containment. Saturn gives birth to new forms, which is indisputably a feminine function. As that energy was being hijacked to make it into a masculine force, it became a distortion of the birth process, with Saturn re-absorbing his own children. Who is the most likely to discover this secret if not his/her own children? It is in fact Saturn’s son, Jupiter/Zeus – a true male archetype - who escapes this fate, and tricks Saturn into vomiting up the rest of his children. The polarity of Saturn got reversed within human consciousness…this can only have lead to confusion, chaos, fear and a deep psychological wound in the mind of western humanity which has been fed on these myths since Roman and Greek times. Now it is up to Mars in its soul aspect to heal this wounding, and to restore the relationship between the spiritual warrior and the Goddess, which holds the key to the whole process of incarnation into the material realms, and approaching and understanding the physical world as being sacred. The second pattern contains Uranus, sextile Pallas, sextile Ceres, sextile Jupiter. This “Cradle” pattern holds the gestation process of the intuitive/creative (Uranus/Jupiter) levels of the mind reabsorbing the wisdom (Pallas) and spiritual nurture (Ceres) of the feminine (Goddess) energy. The involvement of Mars in this pattern is doubly significant as we near the closest approach of Mars to the Earth for 60,000 years, according to NASA. “Much has been made of the fact that the August 27th encounter with Mars is the closest in some 60,000 years. Neanderthals were the last to observe Mars so favorably placed. This is true. It's also a bit of hype. Mars and Earth have been almost this close many times in recent history. 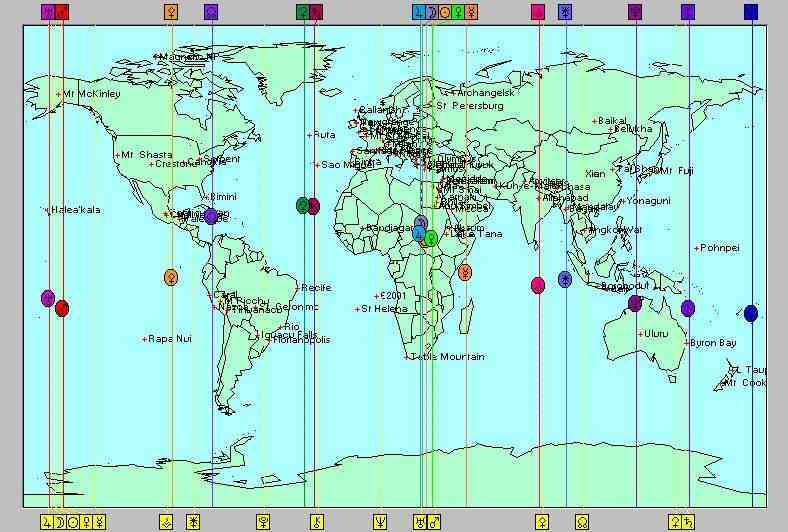 The time and Location (Hawaii) chosen for this chart is significant because of the Astro*Cartography alignments of the planetary meridians over the world’s major sacred sites at that time. There are many other times during the day where significant alignments occur. Clearly the whole day (and the days around it) all have significance. This one seems to be the most crucial time and the places for grounding the positive aspects of these planetary energies, for those who wish to focus through prayer, meditation and ceremony at sacred sites. 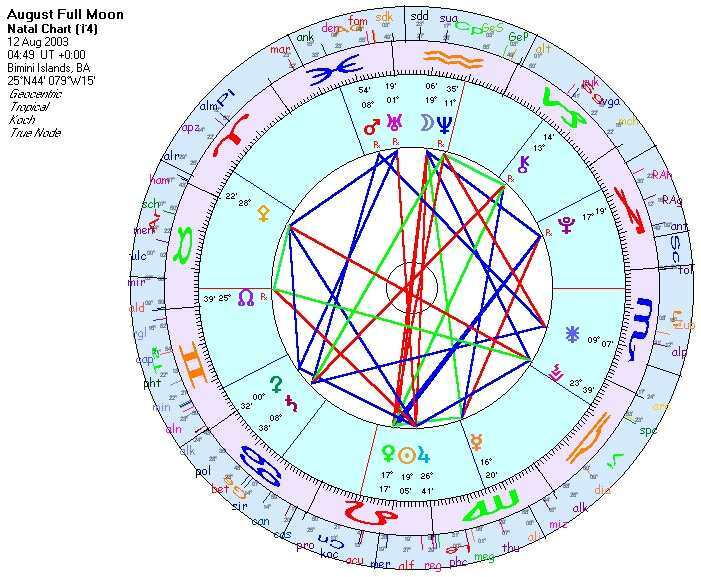 The key figure in this chart is the “Kite” pattern, with the Mars/Uranus conjunction in Pisces on the Midheaven (MC), which will be true for most locations around the world just after midnight Local Time. Mars/Uranus is in opposition to the Moon (Leo)/Jupiter/Sun/Venus (Virgo) stellium (conjunction). The “wings” of the Kite are held by Ceres/Saturn conjunct in Cancer and Vesta in Scorpio. Mars and Uranus form the “tail” of the Kite, which at this time of day will be descending to Earth. They are bringing the energy of breakthrough and release from the old Piscean Age destructive patterns of the warrior, and a return to alignment with the Wise Man archetype and the wisdom of the Ancestors and the Grandfathers. Mars is also conjunct the stars Deneb Adige in Cygnus the Swan, and Fomalhaut in Piscis Australis –this is the Southern Fish, who drinks the water flowing from the urn of Aquarius the Water Bearer. Fomalhaut is the brightest (alpha) star of this constellation. The ancient Greeks aligned temples to Demeter with the rising of Fomalhaut, so it has been concerned with Goddess wisdom, new life and fertility. The role of Mars here, as it comes closer to the Earth is to bring the seeds of the emerging wisdom of the Aquarian Age, and to return to Earth the positive, creative frequencies of Mars energy embodied through the focused and spiritually aligned personal will. Fomalhaut was known as one of the four Royal Stars of Persia, each of which represents a trial or test (Brady). It calls on the individual to challenge mainstream thinking and accepted ideals in order to reach a deeper and purer ideal. With Mars and Uranus involved this is concerned with challenging the methods applied universally towards the resolution of conflicts, both internal and external. Uranus brings the capacity to cut through to the core of the issue. Deneb Adige is the alpha star of Cygnus. It is “a very subtle star associated with the strength and hostility of the swan, but at the same time holding within its symbolism the mystic, transcendent qualities of shamanistic legends of the creation of the World Egg” (Brady’s Fixed Stars). Aligned with Mars in this way, it represents the heroic journey of the spiritual warrior towards self-awareness. The alignment with Uranus opens the way for this journey to be experienced universally by the whole of humanity. The key with Uranus is that we can choose to embrace change willingly, or be thrust into it – either way, there is an inevitability about it. Both Mars and Uranus are retrograde, which further emphasises the need for release from the old patterns, dating back from at least the last 60,000 years, and bringing the opportunity to respond differently from how we have done during previous Mars approaches to the Earth in that time frame. This opposition is challenging each of us to express the most noble aspects and qualities of our emotional self. The Moon is conjunct Regulus, the alpha star, which represents the heart of the Lion, Leo. This is another of the 4 Royal Stars of Persia. Regulus demands that we express the highest levels of integrity in order to achieve success – its worst danger is that we might be tempted to act out of revenge, which we have been witnessing in many countries globally, and particularly in the Middle East. It is as if Mars is saying we each have to find a different way to resolve ancient conflicts, and to release all the accumulated karmic hurts and resentments that have been going on since time immemorial. The key to this is to maintain a nobility of spirit and courage through which we may rise above our identification with our personal issues and gain an overview (Jupiter) in order to see how we each individually can come back into a state of harmony (Venus) and loving acceptance of one another. This is true at a personal as well as collective level. The conjunction of Sun with Moon, Venus and Jupiter is bringing a softening to the Mars male energy. It demands that we find the ways to express our will and our wants on a day-to-day basis, with gentleness, love and compassion. Uranus is letting us know very quickly if we step out of alignment with this, and gives a short sharp cosmic slap to bring us back to that alignment. The Swan is aware of both its power and its beauty – it has no need to prove anything, nor does the Lion. Simply by being who we are, in our most noble, focussed and self-contained expression is enough to gain the respect and love of those around us. The two “wings” of the Kite are held by Ceres conjunct Saturn in Cancer, and Vesta on the cusp of Libra/Scorpio. These planets and asteroids represent the qualities necessary for the Kite to be able to “fly”, to reach its goal, which is to bring release from the old imprinted patterns and bring the new Mars/Uranus frequencies to Earth. On the one hand Saturn and Ceres require that we see beyond the forms and structures and entrenched patterns of Saturn to reach for the spirit or essence that lies behind them, and allow ourselves to be spiritually nourished and held by the underlying Life-force of the Divine feminine (Ceres). The importance of our recognition and connection with the feminine spiritual essence of the Earth cannot be over-emphasised here. Time to let go of neediness and mother issues to open to the loving embrace of the whole of life. So much of the distorted and destructive expression of Mars’ warrior energy in the past has stemmed from a lack of a true, loving understanding of the sacred nature of the Planet’s consciousness, and the attitude that survival depends on pitting ourselves against Nature, rather than co-operation with Her. This process requires forgiveness of self and others, and the willingness to soften and release these ancient held patterns and judgements, at the deep soul level, where they are rooted – this requires that we delve deeply enough to go beyond our conscious beliefs, and acknowledge the core patterns and imprints that have been held in our soul for millennia. Vesta is calling each person to align with the creative fire of their Life-force, remain true to their innermost integrity, and listen to the quiet voice of their heart in order to follow the truth of their own being….it is not about taking anyone else’s word for it any more, unless there is a deep resonance within your own soul. Asteroid Pallas Athene, opposing Vesta forms a “Mystic Rectangle” pattern, which “grows” out of the “Kite”. Pallas’ role here is to step back from oneself and examine one’s beliefs, no matter how dear they may be, and test them against the reality of our experience now. Pallas in Aries is about being ruthlessly honest with self and others in order to discern whether the “reality” which we hold to be true in our hearts, is in fact a true perception of a larger spiritual Reality, or merely some sort of romantic or idealised wishful thinking. you would not question their decision. Or listen to the clattering voices that make each step a decision. High up, on that bright hill. This is the moment when the North/South Meridians (MC) of the Uranus/Mars conjunction begin their transit over the Hawaiian islands, which is the most significant energy portal (Royle Point) for imprinting and downloading planetary energies into the Earth grids. Pallas Athene meridian (MC) passes over Teotihuacan Sun and Moon temples, Mexico. Moon’s North Node MC passing over Nazca Plains and Caral, Peru (having passed over Macchu Picchu and the sacred Valley of the Incas a few minutes before. Ceres/Saturn conjunction MC’s passing over Ruta, N. Atlantic, the area of the most sacred area of Atlantean temples, the codings of which were transferred to the Orkney Islands, Scotland (Ref: William Buehler) Imprinting Divine feminine frequencies into the site which was destroyed through excessive use of Divine masculine power. Jupiter/Moon conjunction MC’s passing over Crete, birthplace of Zeus/Jupiter! Sun MC passing over isle of Rhodes, which lies on the Apollo/Athene Dragon line (The Dance of the Dragon by Paul Broadhurst and Hamish Miller). Rhodes was sacred to Helios, the Sun god, represented by the famous Colossus. The Sun’s meridian also passes over Ephesus and Priene (site sacred to Pallas Athene), in Turkey. Venus MC passing over Pyramids of Giza, and temple sites along the Nile - Karnak, Luxor etc. Again, imprinting feminine Love frequencies into sites that became overly masculine in their focus. Mercury MC passing over Kuwait and eastern Iraq – focussing the attention of the world here again. Vesta MC passing over Mt Kailas, Tibet and Allahabad, India - site of the Kumbh Mela festival in 2001. Grounding Spiritual Love frequencies. Juno MC passing over the site of 2000 temples at Bagan, Burma – frequencies of Right Relationship, direly needed in that country. Pluto MC just passed over Uluru, Australia – Pluto’s energy of spiritual will runs from the deepest levels of the Earth’s energy to the highest aspects of the spiritual realms. Uluru is the perfect place to hold and ground these transformative frequencies for the entire planet. Chiron MC passing over Byron Bay, Gold Coast, Australia and Bougainville, Solomon Islands. Neptune MC passing over Tonga Islands, S. Pacific/Lemuria. Neptune imprinting its purifying, cleansing energies into the largest Ocean on earth through the remnants of the Lemurian civilisation. ALTHOUGH LINKING-IN AT ANY TIME DURING THE DAY WILL BE EFFECTIVE. Within this chart are two Grand trines forming a six pointed star they are Earth and Water trines ~ very feminine qualities. The Moon and her North Node are right over Iceland at the moment of greatest eclipse, this is a Lunar eclipse not to sleep through, for the beauty of this should be experienced fully. This is a very short total solar eclipse, visible somewhere just off the Antarctic shelf South of Australia, this eclipse occurs almost exactly over the magnetic South Pole which means it will about opening up that portal to release and connect into outer solar system energies. At the same time, as with all Total Solar eclipses, the vortex will pull the energies through the Earth from the exact opposite point on the planet so whatever is over that place, be it planets or stars will have great significance. In this case the opposite point will be the magnetic North Pole; this where the Solar Wind flows in so this eclipse will be pulling up through the Earth (our subconscious, that which is below our feet) the dynamics around the Sun depicted in the Helio-centric chart, and more especially the stellar energy of the first stars of Aquarius. This line-up of planets in Sagittarius would indicate much aspirational and inspirational spiritual thought, which will be impulsed to find form and expression, through Saturn, in our relationship ~ with everything. Looking at the Helio chart it seems once again that Ceres (Solar Goddess) is involved in this process. THERE ARE MANY SOLAR AND LUNAR ECLIPSES BETWEEN THESE TWO DATES AND WE WILL BE ADDING AND UPDATING THIS BOOKLET TO MAP AND INVESTIGATE THESE, IN TIME. CHIRON STARTS TO MAKE CONTACT (CONJUNCTION) WITH NEPTUNE. THIS IS ONLY THE SECOND CONJUNCTION WITH A ´SPIRITUAL´ OUTER PLANET SINCE CHIRON´S DISCOVERY. HEALING OUR DEEPEST COLLECTIVE SELVES. THIS IS A TIME FOR REAPING THE SUPREME LOVE THAT ORDERS UNIVERSES. IT WILL BE A TIME TO EXAMINE THE REALITIES WE HAVE CREATED AND TEST WHETHER OR NOT THEY ARE CENTRED ON LOVE, TRUTH AND COMPASSION. This process continues until around 2012 when gradually Chiron ´pulls away´. How amazing that, during the time of this conjunction, Chiron and Neptune span Pisces and AquariusÉ a vital step into the Aquarian Age. A long period of time, a lot of processing, a lot of seeing through the illusions we have built around us ~ to find our golden hearts. There are 4 Total Solar Eclipses during the period that Chiron is conjunct Neptune, here are the dates. This eclipse goes around the circle of the North Pole starting in Northern Canada and ending in China close to Xian and the Chinese Pyramids. 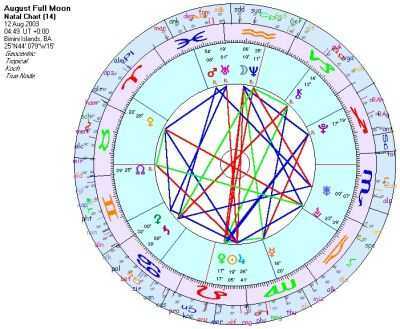 Chiron, Moon´s North Node and Neptune imprint into HawaiiÉthis is a very important eclipse. Starts just before Delhi in India and goes across China and ending just short of the Society Islands in the Pacific Ocean. As with the last eclipse Chiron and Neptune are on the other side of the world to the total solar eclipse i.e. in darkness. The vortex of the eclipse is pulling them, along with the stellar energy of the first stars of Aquarius, up through the Earth ~ up through our subconscious. In the midst of Chiron´s contact with Neptune, Jupiter joins in the fun adding its expansive energy making absolutely sure we do not forget what is going on. This is one eclipse that imprints the three of them into our world. This is the longest Annular Eclipse between the years of 2001 Ð 3000. Starts in West Africa and goes all the way to below Beijing in China. This Total Solar Eclipse runs from just below the Society Islands across the Pacific Ocean to end at the Southern tip of South America in Argentina. Jupiter and Uranus are also conjunct for this eclipse É and interesting combination don´t you thinkÉanything could happen! Again Chiron and Neptune are on the other side of the world to the eclipse. This eclipse occurs over the Pacific Ocean, starting close to Darwin in Northern Australia and ends in the Pacific Ocean off the coast of Chile. 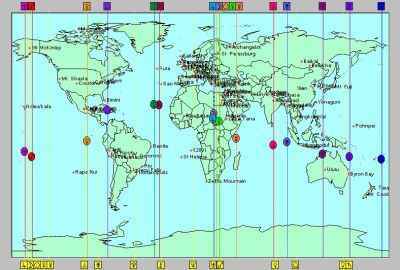 This eclipse underlines the importance the year 2012 for this is the first total solar eclipse for a long time where at the moment of the maximum eclipse the Sun/Moon and Moon´s North Node meridian are exactly over Hawaii. Chiron/Neptune are still in conjunction and imprint into the Americas, just at the place where day turns to night. One of the gifts of this eclipse is that Chiron/ Neptune are part of a water grand trine with Saturn and Ceres (Pha‘thon) holding the other two corners of the tri-angle. May the Blessings of this year flow into the Heart of the Earth.